Since February I’ve been riding all the time on my time trial bike. It makes sense to get used to the bike you race on. But, although it’s only late April, in the back of my mind I start to think about the hill climb season. So when the weather turns a little better I get the road bike down from the loft and start to do some hills on it. It’s always a bit of a shock to the system. It’s hard switching between TT bike and road bike. When I got on road bike yesterday, it felt uncomfortable, slow and hard work. I find a time trial bike much faster and more comfortable. It feels a little strange, usually the problem is cyclists going the other way. They ride all year on a road bike then really ache after doing a time trial in TT position. Still it’s important for me to get back into the swing of going uphill on the road bike, even if it is much harder work cycling the 20 miles from Oxford to the Chiltern ridge. 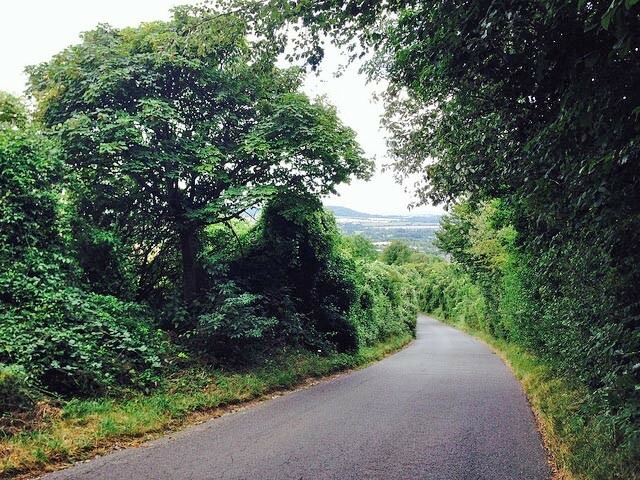 Kop Hill is a good hill for hill climb practise, Just over a mile long, averaging over 9% – it is a typical Chiltern hill of variable gradient. For the full climb, you goes south east out of Princes Risborough, leaving town on Brimmers road, and after 400m or so, you turn left on to Kop Hill proper. Kop hill starts off fairly gradually, but gets steep in the middle and towards the end there is a tough kick. It is perhaps 20-21% at the steepest and will definitely have you getting out of the saddle. The hill reminds me a little of a ski slope. It’s a great view coming back down. From the top of Kop Hill you can turn left straight down Whiteleaf Hill. If you are so inclined you can do a u-turn at the bottom and come straight back up Whiteleaf. Whiteleaf Hill is slightly harder than Kop Hill, but essentially quite similar. But, if you’re looking for hill intervals, you are spoilt for choice in this part of the world. I did a few reps of both Kop Hill and Whiteleaf hill. By the time I got back to Oxford, I’d managed 74 miles with 2,100m of climbing. But, I was starting to ache much more than usual. 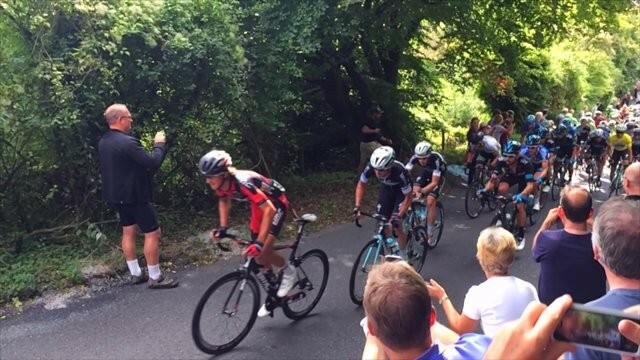 Tour of Britain – Kop Hill, slow motion from Ian Warr on Vimeo. 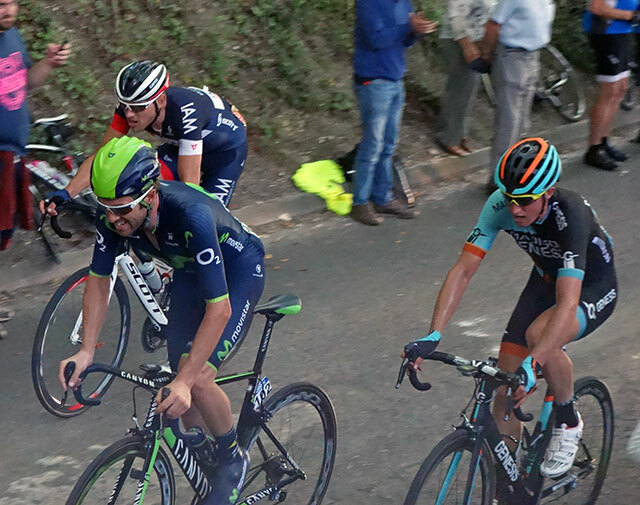 In 2014, the Tour of Britain went up Kop Hill towards the end of a long stage taking around five minutes. The 2014 stage started in Bath and also went up Chinnor Hill it finished in Hemel Hempstead and was a really epic stage. It put Alex Dowsett into the leaders jersey after a day long break with Matthias Brandle and Tom Stewart (Madison Genesis). I watched the race on Chinnor Hill. This weekend is ironically the first hill climb of the season (Shap Fell). But, at around 3% I will probably be using time trial bike. It is also the Tour de Yorkshire, so hopefully I will get to ride some hills and perhaps watch a stage as it goes up the Cow and Calf.